Let me take this call..
Home » Let me take this call..
Oddly enough, the most unpredictable part of my job is returning and making phone calls. The telephone is a Pandora’s box. Depending on the task at hand, I may be returning a call from an upset client (whose leash we did not return when they picked up Fluffy from boarding), calling someone with lab results (this is frequently to deliver bad news or to have an in-depth discussion about the possible explanations for a given set of test results), or to answer a question that is to complex or “medical” in nature to delegate to a staff member. I try to designate time during the day to place these calls when I don’t expect to be interrupted or called away to see an appointment, deal with a critical patient, perform surgery, etc. I always want to give the client on the other end of the phone my undivided attention so that I can answer their questions correctly and help them make whatever decision might be before them. Basically, I want them to feel they have my attention and effort, just like they would if they were with me in an exam room, speaking face-to-face. The most important part of my job is communicating with the pet owner. So, with this in mind, I will now mount my soap box…. If your pet is staying at my office or one or more procedures, tests, or therapies, and you’ve given me your mobile number to call when I know something or need to discuss your pet’s status with you, I don’t expect to get a call back 3 seconds (not enough time to have even listened to my message on your voicemail) after hanging up. That tells me someone’s been screening their calls. Pick another day to be uber-private and stealthy, not the day your pet is at the veterinarian with blood test and x-rays pending, Likewise, if you’ve come to us for help with your pet (why else would you come to see a veterinarian? 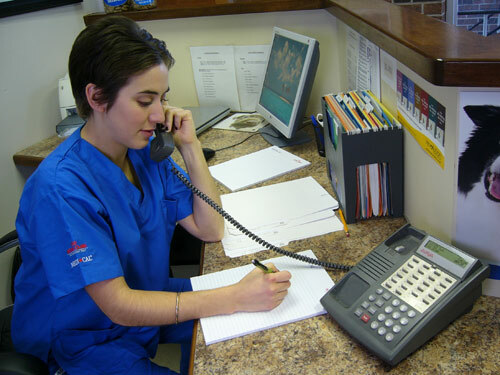 ), have the courtesy to turn the phone ringer off while you are in the exam room. Yes, even the ring is distracting, especially when you pretend to ignore it while I continue to try to keep a coherent train of thought or speech. Same goes for texting. Not only do you have to break eye contact and stop paying attention to what is going on with your appointment, it tells me that whatever is happening on that small screen is more important than your pet, and that’s worrisome. Before you chalk it up to “young folks these days”, realize that at least half of the people I see demonstrating these poor manners are adults – my age, and older. Yes, even baby boomers get addicted to and consumed by their devices. Even people of my parents’ age will jettison the manners they tried to instill in their children, and the manners they exemplified less than 10 year ago. Don’t get me wrong, if you’re waiting for me to come in to begin the appointment, or I’ve stepped out of the room, please, by all means resume your phonicating. But while I’m talking? To you?